I don’t know if you heard about it, but NYC had some bona fide Biblical Weather last week. (A tornado. In Brooklyn. What next? Grasshoppers?) I just couldn’t stand to post a mini-tute on how to make the Buncha Squares blanket without decent pictures of the thing. (You know how I love to run around in public with a big piece of knitting and try to take pictures of it all day long. Super fun!) Eventually, I gave up on the city and hauled the blanket back out to Southampton, where the weather and the Involuntary Models are cooperating. I may have taken too many pictures. I don’t know. It took me a long time to knit this thing, and I think I’m entitled to take as many pictures as I want. Here are the yarns I used. I didn’t keep track of the exact quantities, but the yarns are listed in order of how much I used of each kind. The blanket requires 16 log cabin blocks. I made 3 types of blocks, which I called Fat, Skinny and Medium. I made 5 Fat, 5 Skinny, and 6 Medium. All blocks have 9 strips. 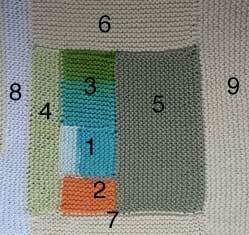 The difference between the three types is in the proportional size of each patch or strip, especially at the center. For all types of squares, you follow the same color sequence (except when you don’t feel like it). 1. First Strip (the center square) is always in blue or a blue mix (think of a lake). 2. Second Strip is always orange or yellow (think of sunshine and beachballs). 3. Third Strip is always green (think of a forest by the lake). 4. Fourth and Fifth Strips are always dull or pale green. 6. Sixth, Seventh, Eighth & Ninth Strips are always cream or white. In other words: Blue, Orange, Green, Green, Green, White, White, White and White. That’s all you truly need to know. It matters not what style of log cabin block you make: traditional or Courthouse Steps. The proportions of the colors do not matter either. Knit them as you like, and at the end make them all roughly the same size so that you can sew them together. OK, that’s probably not teachy enough for some people. Here’s a little more detail on my version. 1. Cast on 18 stitches in blue yarn (here it’s blue-green-brown Noro Lily). 2. On one side of the finished patch, using orange yarn (here it’s pinky-orange Tahki Cotton Classic Tweed), pick up 18 stitches (picking up one stitch in the end of each garter ridge), and work garter stitch until you have 10 garter ridges showing on the RS, then bind off on the RS. 4. Now turn the piece so that the first patch is oriented as shown. Using green, pick up 38 stitches across the top of the piece (10 in the garter ridges of one side strip, 18 in the bound off edge, and 10 in the garter ridges of the other side strip), work 10 ridges of garter stitch, and bind off on the RS. 5. Now go to the opposite side of the block and repeat what you did for the 4th strip. 6. Using cream, pick up 38 stitches as shown and knit 9 garter ridges. 7. Using cream, go to opposite side and pick up 38 stitches again, work 9 garter ridges and bind off on the RS. 8. Using cream, pick up 56 stitches as shown, work 6 garter ridges and bind off on the RS. 9. Using cream, pick up 56 stitches as shown, work 12 garter ridges and bind off on the RS. This square is now done. You will notice that in the last two strips, you divided 18 garter ridges unevenly between strips 8 and 9, knitting 6 garter ridges on strip 8 and 12 on strip 9. You could just as easily have knit 9 garter ridges on each strip, or 3 and 15, 4 and 14, etc. You can be symmetrical or assymetrical with any of the strips, as long as you end up with a log cabin block that is roughly 12 inches square. For the other two types of block, I am not going to spell out the exact number of stitches and ridges for strips 4-9. The graphic design of the square is determined by the first 3 strips. 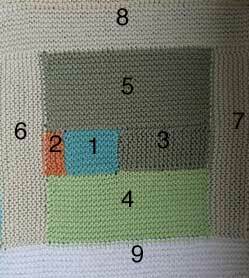 After knitting the first 3 strips, use the diagram as a guide to color placement and proportion, and knit strips 4-9 until the block is roughly 12″ square. Do not fear asymmetry! Asymmetry is your friend in this project! 1. Using blue, cast on 10 stitches. Work 8 garter ridges and bind off on the RS. 2. Using orange, pick up 8 stitches in the ends of the garter ridges of the first strip. Work 4 garter ridges and bind off on the RS. 3. Using green, go to the opposite side of the piece and pick up 8 stitches in the ends of the garter ridges of the first strip. Work 20 garter ridges and bind off on the RS. 4-9. Using the diagram as a guide to proportion and color placement, continue adding strips until the block measures approximately 12″ square. 1. Using blue, cast on 12 stitches, work 12 garter ridges, and bind off on the RS. 2. Using orange, pick up 12 stitches in the ends of the garter ridges of the first strip, work 7 garter ridges, and bind off on the RS. 3. Using green (in this case, Katia Jamaica blue/green), pick up 12 stitches in the ends of the garter ridges of the first strip, work 17 garter ridges, and bind off on the RS. None of the numbers are cast in stone. Some of my fat squares were fatter, and some of my skinny squares were skinnier, because I cast on more or fewer stitches. The color placement is not cast in stone. If you look at my blanket, you will see places where I broke the color rules to suit my fancy. A bit of variation makes the blanket more fun to knit, and also makes it more fun to look at (in my opinion). 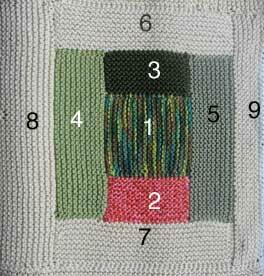 After you have knit a square or two, you may have figured out how many stitches/ridges it takes for you to knit a 12″ square. If you know this, and adhere to it, you will have an easier time sewing your squares together because they will not vary much in size. Another way of adding visual interest to the blanket is to sometimes pick up stitches for a new strip on the wrong side of the old strip. I did this quite to add another quilt-like touch. The right side and wrong side of each square are only finally determined by which side you decide to sew the ends into. Arrange the squares in 4 by 4 formation, to suit your eye. I placed fat, skinny and medium squares randomly, but I alternated the vertical and horizontal orientation of the centers. (Look at the photos to see what I mean.) If your squares vary in size, you can compensate for this by arranging them so that each strip of 4 squares will come out as near to even with the others as possible. Join the squares into 4 strips of 4 squares each. I used whip stitch, placing the right sides of the squares together and whip stitching on the wrong side. To ensure that the blanket would lie flat, I took care to maintain a 1-to-1 correspondence between stitches and ridges on either side of the seam, without any stretching or bunching of the knitted fabric. I did this even when it meant that the squares didn’t line up exactly opposite each other, or when it resulted in a strip being longer or shorter than the other strips. Lay out the 4 strips. If there are any strips that are shorter than the rest, use cream yarn to pick up stitches and add the necessary number of garter ridges to equalize the strips’ length. Once the lengths are equalized, join the strips together using whip stitch on the wrong side, just as you joined the squares to form the strips. I used Katia Jamaica to make an applied i-cord edging as described in this post. So, my friends, my fellow people of the log cabin, have fun with this. Tell me if anything is not doing right for you, but remember that it’s sposed to be a little crazy. I would really love to see photos of what you come up with. P.S. I would like to thank my Involuntary Models, Carrie and Kristin. Kristin: Does she make you do this a lot? Carrie: More than you would think. Lovely and oh-so-impressive! That’s quite a commitment! 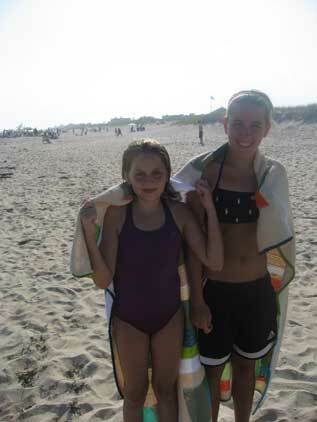 I love the beach pics! Abolutely gorgeous, Kay. I have never made a blanket bigger than a baby’s crib, so I am in awe. The girls are lovely too. Growing up nicely, aren’t they? Great blanket. Thanks for sharing the recipe. Is it difficult to get sand out of hand knits that visit the beach?? That last photo is as lovely as anything I’ve ever seen in a quilting book, and lovelier than many photos I’ve seen in arty “coffee table” books. Fabulous. You should find someplace to publish it, even if it’s only on the wall in your own den. Nicely done. handsome!!! please don’t part with it! i never would have guessed whip stitch. i was convinced that you used the 3-needle bind off. absolute perfection! Kay that is gargeous, gargeous, gargeous. You have such a talent for the colors and arrangement. The photography is beyoutiful too. Thanks for sharing! Repeat after me: there is no such thing as too many photos. Of anything. Especially if it’s handknit. And at the beach. Maybe you can get Ann to write that out in her new fancy-pants lettering? Gorgeous! Our poor kids… the ways we torture them… I think you certainly deserve to take as many photos as you like! I’m just trying to knit a baby blanket and it’s taking FO-EVAH! I bow to your log cabin speed! 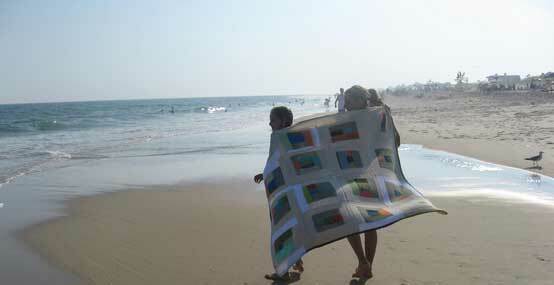 The blanket is beautiful, and not for the first time do I wish I had your color sense! I could look at pictures of it all day– never too many pictures! Beautiful. someone already asked, but did you get sand in the blanket? Really, now, what do you need me for? Very nice. Really gorgeous blanket, Kay. I think I’m going to have to use all my cotton scraps and work on one of these as a really long-term project. Another example of “can’t get enough of a good thing”. Just think of how many words all of those gorgeous pictures saved you! And I have to say that your way of making a rule and following it until you don’t is my kinda rule. A Masterpiece!! That wasn’t lying directly ON the sand, was it???? I love the photography but I find myself wanting to scream at the models, “Don’t let that touch the water! 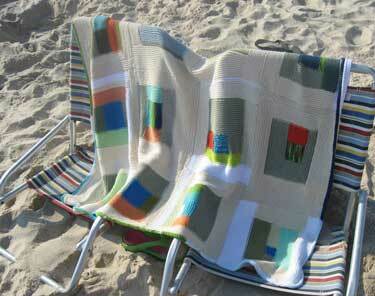 Don’t let that touch the sand!” Please tell me it’s not meant to be a beach blanket! I can’t decide which is more lovely – the blanket or the photos. That blanket is a total masterpiece, in an aw-shucks, hardworking sort of way. I love it! That’s it. I need to cut off my internet access. I’ve visited three blogs today and have added 3 BIG projects to my “cast on tomorrow” list. I love how you give recipes, which gives us room to change it up as we like. Just went to Knitpicks to buy your book, and yarn, and it’s sold out of M-D Knitting. I guess this is a sign that I should go look through my stash first. So summery, that blanky. It looks homemade in the best possible way. Nothing in the world but a human could have made it, and that’s what I think is so great about all this handknitting. So much love for this blanket! So pretty!!! I would love to be sitting on the beach right now. Beautiful blanket. And the beach looks mighty nice too. Kay…what a fabulous blanket! You are the “Goddess of Blankets!” I still longingly look at your mitered square blanket. By chance, did you ever come across the Tahki Cotton Classic color that you used on your earlier silvery grey/peach/brown blanket? The girls are so funny! I think Carrie may take after her Mum. What a fun, fun blanket! It’s so summery with the white yet I love those pops of color. I can’t imagine allowing something that special to lay (lie?) on the sand, though. I’d be having heart palpitations. This is such a fun blanket. I think I’ll have to start something like this when I finally finish my miters. So pretty. For some reason, the colors remind me of a martini olive with the pimiento in it. But that’s just me. I love this photo shoot sooooo much. It makes me want to knit the blanket. This is just a really special knit blog! The blanket is quite lovely and I do adore a blanket as cape photo. Love it, love it. Indeed, it does look like a martini with a pimiento-stuffed olive! And the girls, the beach, and the pictures are beatiful too.
. . . beautiful, not beatiful. . . Many, many thanks for going to all the trouble to record your work. The color play of this blanket is magnificent, and I confess I wanted to reproduce it the minute I saw it. Except really, it oughta be hangin’ in a museum at some point in its life. It’s a unique beauty, and I loved all the photos. Your blanket is stunning. I’ve got a break from baby blanket making for the time being, but I’m sure my friends will start up again soon! Oh. My. Gosh. I absolutely *love* it! Love that last photo the most, but I think I love the overheard conversation more!!!!! I really really love this. What’s the next blanket? Wow, thank you. I wish for a time when I can make something like this. And I commend you for a gorgeous blanket. Thanks so much for the detailed instructions – I’ve been impatiently waiting for them since I first saw the blanket. I’ve got lots of wool here to make my own – burgundy, purple, blue, blue with cream edging. It’s ok to make it in wool, right??? That is the secret to success for the whole M-D philosophy, I think. inspiring! coming from knitter that has been lacking inspiration of late! My knitting mojo is just starting to return after a near 5 month absence! 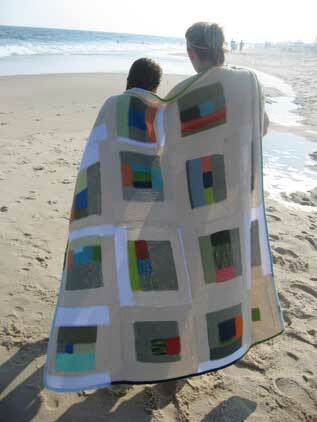 Fantastic blanket and lovely pictures – I love the flashes of different colours. That’s my kind of directive! Beautiful blaket – a treat for the eye. It’s beautiful, Kay. Worth every photo. Have I ever told you how much you make me wanna quit my job and just knit? Really. Completely. Fantastic. I love the way you photographed this on the beach and all. Me living 5 miles from one and haven’t set foot on it in years. I love this blanket!!! Thank you for posting the recipe and the wonderful photos. Now I want to knit one AND quilt one. You have forwarded the photos to Denise Schmidt, haven’t you? The blanket is absolutely beautiful and the pictures are great. I can almost feel the sun on my face. What a perfect setting and what lovely (and growing quickly) models! Now I want to ditch my Noro log cabin and start one of these. Like right now. Thank you M-D K for inspiring me yet again, and for spreading some sunshine across the pond (limited access only – so does that mean there’s a booking system?) to a rainy windswept England. And as for that last photo, Rowan – eat your heart out! I have a quibble. Why do we stop thinking of things (landmarks, whatever) by the lake after step 3?!? And also, I really really really like the multicolor applied i-cord edging. I don’t know if I could ever bring myself to do it–god, I’m awful, if you saw my Baby Moderne, well, I never did any kind of edging on it! but I love yours. 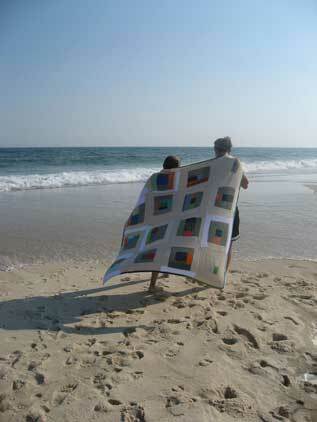 Love the blanket, love the pictures – can you have too many photos taken at the beach? I think not! Beautiful, Kay. Makes me feel better about my random colours in my barbara walker blanket for my niece. MUST MAKE BLANKET. So impressive I clicked on Post twice. B-u-tee-ful!! With a CAPITAL B! Loved the mixtuere of whites. I want to second the comment mady be Abby earlier. I’d love an explanation as to the pros and cons of binding off each color block as versus using yarn to hold the live stitches. I’m currently working on the Moderne Baby Blanket. And picking up the stiches from the bound off edge is my least task and the cause for significant pauses in the action. So two nights ago when finsihing the latest color block I didn’t bind off but did thread yarn through the stitches. PS. 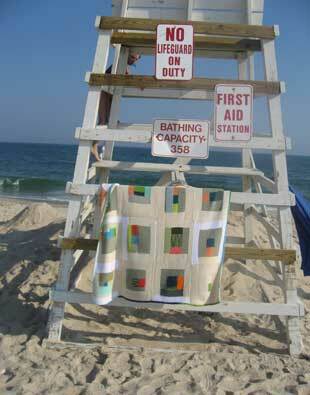 There can never be too many photos if one is combining knitting and beach scenes. chiming in with my love for that last photo. i can hear the gulls!! gorgeous blanket, kay. So gorgeous and perfect. You really have an eye. What a great blanket… there can never be enough photos! You are a true artist! It’s absolutely beautiful. I love the simplicity of it, the minimalism. Gorgeous, just gorgeous. Thanks for not only showing it to us but also showing us how to do it ourselves. I can hardly wait to try something like that (which I never would have figured out on my own). So thank you thank you!! 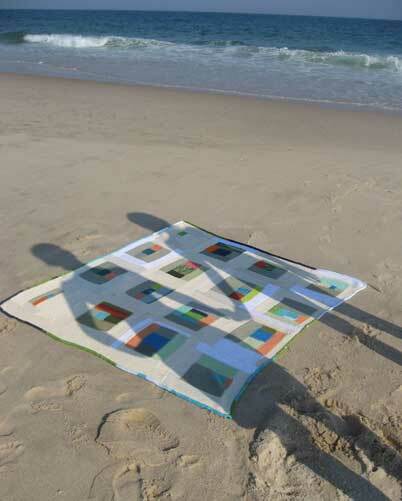 Didn’t have time to read whole post or pattern right now but I had to take the time to say that the photo of shadow of the couple holding hands falling onto the blanket is inspired. I would actually pay real money for an enlarged print of same. Good eye, good creativity, good work!! That blanket is gorgeous! I liked it so much, I ran out after work and got your book (finally) and a double armload of cotton yarn and began my own. Wow ~ That blanket is really beautiful. Really. Simply perfect. You have a real eye for color. Just splendid. I think you’ve just inspired me to knit a log cabin blanket! TRULY A WORK OF ART THAT BLANKET IS! The kidlings are cute too! Beauty at the intersection of persevernce and spontaneity. I am also a Denyse Schmidt fan. When I talk about her quilts, my mom/knitting teacher says something like, “That’s nice, dear…maybe it could give you ideas for knitting one.” My reply was usually, “THAT WOULD TAKE TWENTY YEARS! !” Thanks for proving me wrong. And thanks for doing it so I don’t have to. It looks absolutely beautiful, by the way. “Blue, Orange, Green, Green, Green, White, White, White and White.” Can we put it to song? Maybe with a bouncing ball to guide us. Alternately, we could try a mnemonic device — But Oh Good God Gail, Why Wait With Whitey? It’s lovely. Thank you for the recipe. Do you still see the comments when they’re on a post this old? I went searching for this, as it’s time for a new pool project ~ Wee C’s joined the swim team! Miters were great fun in ’06 but I think I’ll log cabin in ’08. I’ve augmented that same stash of Reynolds Saucy . . . not yet sure what my color “chant” will be! How did I miss this post from last summer? I just surfed up to it and I can tell from your blanket shooting endurance levels I rubbed off a little on you. Carrie must hate me. and PS I LOVE that blanket. This must have posted when I was on vacation in the wild west last summer and my laptop broke. I love it!,, Just enough instruction to be inspiring and encouraging.